Science and Christianity: Conflicting or Compatible? There exists a misconception (whether willful or unintentional) among many, that science and Christianity are mortal enemies. Some believe the rift is so profound as to prohibit any interaction of the two. For the secular naturalist, science has all but proven that God does not exist; therefore, faith in God is merely a crutch for the unlearned to lean upon. Many of these scientists think that Christians, or anyone who allows for the existence of God, is incapable of doing good science. For the Christian who has not thought deeply about this issue, the scientific community is often viewed with suspicion, distrust, and sometimes outright hostility. Many believers see an impregnable barrier separating faith and science. This is often due to a misunderstanding of faith, or science, or both. Nevertheless, for Christians, there is cause for a healthy skepticism towards much of the secular scientific community. These scientists, who only allow for naturalistic material answers in their research, often claim that certain scientific theories eliminate the need for God and that anyone who continues to believe in Him is ignorant of the facts, backward in their thinking, and stuck believing in fairy tales or outdated myths created by simpletons of the past. These kinds of attitudes tend to foster conflict more than honest discussion and debate. 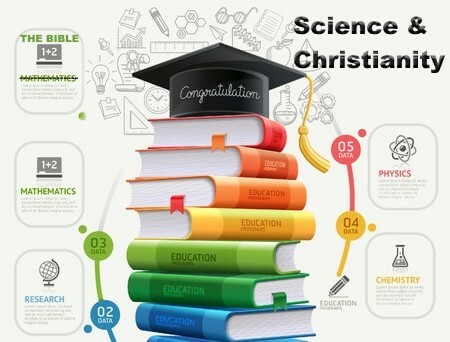 There were, and are, many scientists who also believe in God, many who are Christians (See http://www.godandscience.org/apologetics/sciencefaith.html and http://en.wikipedia.org/wiki/List_of_Christian_thinkers_in_science). These men and women have made great contributions to humanity in many different fields of research and development. Is the secular scientific world so arrogant as to claim that these men and women were less intelligent because they professed faith in God? Often, it seems that the God-less scientific community thinks that anyone who does not hold to their idea of the way things are, should not be allowed to do scientific research. How very open-minded and ‘scientific’. So much for their much touted maxim of “following the evidence wherever it leads”. The friction does not really stem from “science versus religion.” but “religion versus religion.” Because, much of the secular scientific community is saturated with the preconceived notion that the only reality is a natural, material reality and that there is no such thing as ‘supernatural’. These God-less scientists think that they have no biases or preconceptions that color their interpretation of what they observe. However, they hold the foundational belief that there are only natural processes at work and that those who believe in God cannot do good science while allowing for the possibility of the supernatural. Therefore, any interpretation of evidence they may uncover cannot be attributed to God; they must make their interpretation fit the godless constructs of their presuppositions. There is another name for this system of belief (dare I say ‘religion’), it is called “humanism”. Humanism is defined by Merriam Webster as, “an outlook or system of thought attaching prime importance to human rather than divine or supernatural matters. Humanist beliefs stress the potential value and goodness of human beings, emphasize common human needs, and seek solely rational ways of solving human problems” . While, Christianity has the Bible as its main religious document; humanism has the Human Manifestos I, II, and III as its go to documents. Christianity and humanism are both recognized by the Supreme Court as religions , and both receive 501(c) (3) tax-exempt status. A religion does not have to posit a God, god, or gods to be called a ‘religion’. Again, Merriam Webster states that one definition of religion is, “a pursuit or interest to which someone ascribes supreme importance” . Science would be impossible in a universe governed by chance or unguided natural processes. ‘Chance’, by definition, is random and unpredictable. Science is based on repeatable, predictable, observable, and falsifiable data. ‘Chance’ and ‘science’ therefore occupy opposite ends of the reality spectrum. In other words, in a world governed by chance, how something works today may not be how it works tomorrow. ‘Chance’ by its very nature is not something that is predictable or stable. The Bible says that God so ordered His universe that, barring His sovereign intervention, the universe performs in a predictable manner, “While the earth remains, seedtime and harvest, and cold and heat, and summer and winter, and day and night shall not cease.” (Genesis 8:22). Bodie Hodge writes, “On what basis should we expect a universe that came from nothing and for no reason to act in a predictable and consistent manner? Because God upholds the universe in a consistent manner, we have a valid reason to expect that we can study the world we live in and describe the laws that God uses to sustain the universe (Colossians 1:17)” . Colossians 1:17 reads, speaking of Jesus, “He is before all things, and in Him all things hold together”. True faith does not simply believe something for no reason; it is a confident trust in God…for good reasons. Far from Christianity and science being incompatible, in order to do science correctly, they are inseparable. Here is a related article for you to read: Does Faith in God and Science Conflict with One Another? Another excellent apologetic look at the evidence for creation Robert. You are so right about the fact that humanism is its putting human ideas, thoughts, and philosophies against divine or supernatural beliefs and to me, which takes more faith…to believe that everything came from nothing (which science itself says out of nothing, nothing comes) than from a Creator which explains the origins of the universe and life so to me, the greatest leap of faith is that the universe caused itself to come into existence than the effect of the universe produced from the Creator Who is the cause of all things. Chance is no thing, not a force or not a causative agent. How much does chance weigh? How long is chance? What are the physical properties of chance? So how can chance be the cause? You see my point. Thank you again for such an intelligent, rational, logical approach to the Bible which is not so much a book about the heavens but a book on how to get there. When trying to describe chance, I like the example of putting your clothes in the dryer and at the end of the cycle you open the door and all the clothes are perfectly folded. It truly does take more faith to be a humanist. I still marvel at God’s creations,whether it be the Canadian Rockies in Banff Canada, the seaside at Bar Harbor Maine, or watching a Cardinal from my back patio in Texas! Great article Robert! I especially enjoyed the quote from C.S.Lewis. I am convinced, more than ever, that God has blinded those he wills, to be veiled to the reality of His created works. As a corollary, for the Christian, I think we have placed way too much emphasis on our “belief” and way too little emphasis upon the settled knowledge of the reality of God we received through the new birth. Let me explain. We are drawn by God’s Holy Spirit when we first trust Christ. It is a step of faith, as we acknowledge our sin and turn from it, and reach out in faith to believe in the death and Resurrection of Jesus as payment for our sin. What occurs next is the movement of the Holy Spirit who takes up residence within us. This is the “experience” of the new birth. What happens upon this experience is that our spirit knows that God’s Spirit is within us. It is revelatory! All things become new! We know that God is real. This “belief” we used to have is no more. The reason is that now we “know”. You will notice in the NT that the apostles after Pentecost no longer talk about the saved “believing” in Jesus. It is because they “knew” Him. Its kind of like saying you believe your wife loves you. I hope that isn’t true. I hope you “know” she loves you. If you believe she loves you that means she might not. It is like saying I believe the mailman will deliver the mail today. We understand that he might not though…we are not sure…because we DO NOT KNOW FOR SURE. If we know the mailman will deliver the mail, then there is no room for doubt. Oh Jesus, may we see this difference! This difference is foundational for what follows. In relation now to your article. The Christian compares his belief in God with the humanist’s belief in their god(materialism/evolution) and concludes that we both are having faith in something or someone. The dialectic argues that neither knows, because neither of us were there at creation. I contest that premise(that neither knows), precisely because the born again Christian “knows” that God is real(It is more than belief), for “The Spirit Himself bears witness with our spirit that we are children of God”(Rom 8:16). Belief…then the experience(infilling of the Holy Spirit, or New Birth)…then the settled knowledge. That is why I contend that those Christians who say, “I hope I will make it to heaven when I die” aren’t so ignorant of Scripture as just unsaved. I pray those reading who are in that category in the last paragraph will see their sin that is separating them from God and cry out to Him for forgiveness. Next trust…believe in Jesus as the sacrifice for your sins on the Cross of Calvary. Plead with Him to save you from your sins and believe that God has raised Him bodily from the grave. ” Therefore, if anyone is in Christ, he is a new creation; old things have passed away; behold, all things have become new”(2 Cor 5:17). We become someone we were not after this new birth…a new creation. God is real and loves you. No more will there be doubt and fear regarding His reality, after the new birth, because His reality will be within you. No more hoping that God comes to take you home. You will know. This power of God dwelling within you, will be with you forever. So where does that leave the humanist or anyone other than the born again Christian? Exactly….believing in their false god…but not knowing. Thank you for the kind words, Doc. And, as always, you’ve added to this subject and given us much to think about. I pray that many will ponder your words and act on them. God bless you!!! Although, there seem to be a colossal disconnection between both the Word of God and science from a humanistic perspective. However, one thing that I strongly believe the more science keeps evolving, the more evident it becomes that the universe didn’t come into existence by accident. Something that’s so complex, well organized, and consistent cannot just come into being all by itself as many falsely believe. Instead, it was something that was well planned by the creator. As you may well know, unbelief is something that’s expressed on purpose. Meaning that if people don’t want to believe in something, they’ll do their best to come up with something else regardless of its authenticity. In many cases, people would much rather believe into a damnable lie than accepting the truth. Thank you for reading and commenting. You make some very good points. God bless you. Next post: How Does The Bible Define Wickedness?